This calendar is made to promote all events related to the focus of psybient.org project. For festival listings visit festival page. Range of covered genres includes, but is not limited to psychill (psy-chill – psychedelic chillout), psybient (psychedelic ambient) aka psyambient (psy ambient, psy-ambient), ambient goa (ambient-goa), psydub (psy dub or psy-dub), dub, downtemple-dub, psydubient (psy dub ambient), psystep (psy step or psy-step), psybreaks (psy-breaks or psychedelic breaks), downtempo, midtempo, ambient downtempo, world, ethnic, ethno step (ethno-step), yoga-whomp, global bass, bass, psy bass (psy-bass), temple bass (sacred bass), chillgressive (progressive chillout), ambient, ambient dub, psydm, idm, trip hop, glitch, electronica and meditative. Basically psychedelic downtempo and psychedelic midtempo music. Feel free to contact us to add your events to this calendar. And don’t forget to visit this page regularly to see updates. this calendar includes “chill” related events and psytrance festivals and transformational festivals. 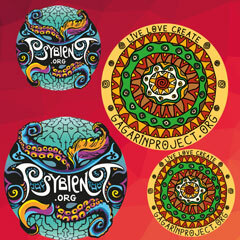 You can also visit a dedicated psytrance and transformational festivals page with more psytrance festivals and events. if you don’t see what you were looking for here you can have a look at our featured event page and also at goabase.